Ever since the Milwaukee Brewers’ last playoff appearance in 2011, things may have not turned out the way Brewers wanted. Last year the Brewers just barely missed the playoffs. They finished the regular season with an 86-76 record and 2nd in the NL Central Division behind the Chicago Cubs. Unfortunately though the Brewers finished one game behind the Colorado Rockies for the second Wild Card spot. However, with ace ball players like Travis Shaw and Eric Thames, Milwaukee may just break the bad streak and reach the playoffs this season. But for that to happen, they need you in the stands. So, get your Milwaukee Brewers tickets here. The Brewers are determined to bring a championship to Milwaukee. They will look to beat out rivals the Chicago Cubs and the St. Louis Cardinals to reclaim the division crown. A long the way, Milwaukee is striving to be the premier team in Minnesota and over take the Minnesota Twins. Grab your 2018 Milwaukee Brewers tickets and head down to Miller Park to lead your team on their championship hunt. Founded in 1969, the Milwaukee Brewers have played some of the most memorable games on field, especially against their traditional rivals, the Chicago Cubs and the St. Louis Cardinals. Here, we look at some of their greatest moments from these rivalries. The 1982 season – The 1982 campaign brings back a lot of good memories for the fans of the Milwaukee Brewers. That year, they won the division title and the AL Pennant for the first time ever.They went on to face the St. Louis Cardinals in the World Series. It remains to date their only World Series appearance. The seven Game series between The Brew Crew and The Birds took every fan on a thrilling ride. Both sides played phenomenally well, but in the end the Brewers came up short and lost the World Series title to the Cardinals, 4-3. Ryan Braun Helps the Brewers Qualify For the Playoffs – After the 1982 campaign, the Milwaukee Brewers failed to make it to the postseason for next twenty six years. However, in 2008 things took a turn for the better for The Brew Crew. In game 162 of the 2008 campaign, the Brewers faced their rivals, the Cubs for a playoff berth. That bout was won by the former thanks to Ryan Braun who launched a two-run home run in the eighth inning to give his team a 3-1 lead. This helped the Brewers qualify for the playoffs. Braun’s heroism that day will always be remembered by the fans in Milwaukee. As mentioned earlier, the Milwaukee Brewers share fierce rivalries with the Chicago Cubs and the St. Louis Cardinals. Brewers-Cubs Rivalry – The Brew Crew and the North Siders became rivals because both play in the MLB’s National League Central Division and are located 83.3 miles from each other off Interstate 94. These two teams locked horns for the first time as division rivals on June 15, 1998, at the Wrigley Field. The Cubs won that game, 6-5. They most recently collided on September 10, 2017, again at the Wrigley Field where The Brew Crew emerged victorious, 3-1. Brewers-Cardinals Rivalry – The Brewers and the Cardinals’ rivalry was born when the latter defeated the former for the World Series Championship in 1982. Another reason behind their fierce competitiveness is that both The Brew Crew and The Birds are members of MLB’s National League Central Division. Since their establishment, the Brewers have called three different ballparks their home, with Miller Park being their present home. This 42,000 seat stadium has been home to the Brewers since 2001. Miller Park features North America's only fan-shaped convertible roof. Fans get to enjoy the Klement's Sausage Race that occurs during each game in the middle of the 6th inning. Brewer history is also displayed with the Brewer Park Walk of Fame and the Brewers Wall of Honor. Robin Yount spent his twenty-year career as a center fielder and shortstop for the Milwaukee Brewers. While Yount was with The Brew Crew, he won three Silver Slugger Awards in 1980, 1982 and 1989. He also took home one Gold Glove Award in 1982. In addition, Yount was selected to play in the All-Star game three times in 1980, 1982 and 1983. Then there is Paul Molitor who stayed with the Milwaukee Brewers from 1978 to 1992. During his time with the team, he played in five All-Star games and received two Silver Slugger Awards in 1987 and 1988. Moreover, The Brew Crew honored him by retiring his number 4 on June 11, 1999. There are other players as well like, Hank Aaron, Rollie Fingers and Don Suttonwhose contributions to the team’s success cannot be forgotten. All these three stars have been inducted into the Milwaukee Brewers Hall of Fame. Though the Milwaukee Brewers have been struggling to find their form since 2011, they have nevertheless some of the best ballplayers in the MLB. With a strong roster, the Brewers now plan to dominate the current season of the MLB and you can watch them. Buy Brewers Tickets from here. Our process for purchasing cheap Milwaukee Brewers tickets is simple and fast. There are so many online ticketing sites, that it can be hard for customers to find the right place to buy Milwaukee Brewers tickets at the cheapest price. At ScoreBig we think of our customers first and foremost. We offer daily deals for Milwaukee Brewers events, so our customers can get the best seats for the best prices. ScoreBig will always go above and beyond to offer the cheapest Milwaukee Brewers tickets on the market. The Milwaukee Brewers schedule above, displays all available events for 2019 and 2020. Once you find the event that you would like to go to, click the red “Get Tickets” button. It is located on the right-hand side of the event listing, it will take you to an Milwaukee Brewers event ticket page. ScoreBig's event ticket page will display all available Milwaukee Brewers tickets for that event. On the event ticket page to help with your search for the right Milwaukee Brewers tickets, use the filters at the top to select quantity, price range, and more. There is also an interactive seating chart so you can pick where you want to sit. When you are ready to buy a ticket, click on the listing, and you will be directed to ScoreBig's checkout page. Upon completion of the information fields, your order will be processed and your Milwaukee Brewers tickets will be delivered via email, mail, or to your mobile device. What makes ScoreBig’s site stand out from the rest? We are constantly analyzing our competitors to improve our site, service, and prices. ScoreBig.com employees strive to offer the best process and experience to buy cheap Milwaukee Brewers tickets. Our goal is to get you the best seats to Milwaukee Brewers events. We offer daily discounts on our site and for special promotions check out our newsletter. If there are no Milwaukee Brewers events currently available, you can use our search feature at the top of the page to see a list of all popular events going on near you. No matter your price point, we have all the best deals and discounts on Milwaukee Brewers tickets. For more information on prices of Milwaukee Brewers tickets and the schedule for Milwaukee Brewers, check out our listings above. The last thing you want to find out is when the Milwaukee Brewers event you wanted to go to is sold-out. Don’t worry in many cases ScoreBig has affordable tickets to sold out events. We sell tickets from GA all the way to premium seating and parking. Skip the scalpers in the parking lot and get your tickets online from top Milwaukee Brewers ticket brokers. We get you in all events, buy your Milwaukee Brewers tickets here from a brand that many trust and rely on for all their ticketing needs. ScoreBig offers a 100% money-back guarantee. If you have been in search of cheap tickets for Milwaukee Brewers, ScoreBig by far is the best option. That’s why ScoreBig has more loyal customers than any other ticketing site. 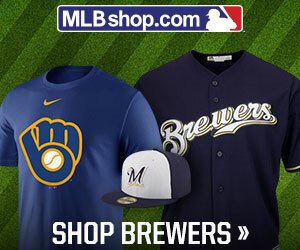 Shop at ScoreBig for safe and secure Milwaukee Brewers event tickets.